The courtyard encircled by the Da Cheng Temple, the Yimen Gate and the East and West Side-buildings is the central part of the Confucius Temple. 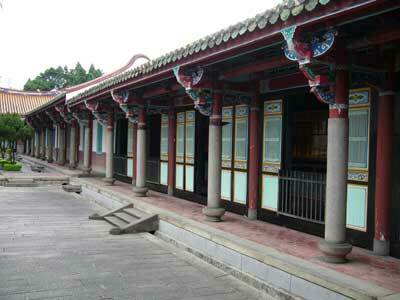 The East and West Side-buildings are like the side rooms of an ancient house. They have lower roofs, and the idol niches inside them accommodate the 154 scholars and outstanding students of Confucius who have made great contributions in promoting Confucianism. The East and West Side-buildings are symmetrically located on either side of the Da Cheng Temple. Because their roofs are simpler, the carvings on the beams are also plainer. The row of pillars in the corridor makes for a strong sense of rhythm. But you won't find scrolls on these pillars. A rule observed by all Confucius temples is "never dare to show off one's literary skill in front of Confucius." The eaves brackets of these two rooms also have lively patterns of hornless dragons that allow one to experience the beauty and intricacy of Southern Chinese architecture.